High precision stainless steel checking balls are made to closer tolerances and avoid excessive side forces. The accurately located shoulder provides for positive positioning, re-positioning, or replacement. 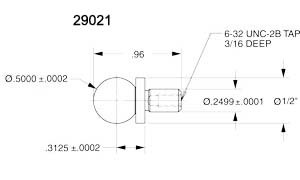 Note: Part Number 29021 has a tapped 6-32 UNC -2B shank. Note: The weld between the ball and the shank is made so that the ball will drop off if subjected to unusually heavy leteral forces. This prevents setup and inspection errors that might occur do to accidental bending of the shank.